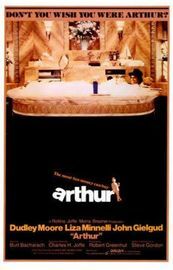 Arthur is a 1981 comedy film written and directed by Steve Gordon. The film stars Dudley Moore as the eponymous Arthur Bach, a drunken New York City millionaire who is on the brink of an arranged marriage to a wealthy heiress but ends up falling for a common working-class girl from Queens. It was the first and only film directed by Gordon, who died in 1982 of a heart attack at age 44.